What does it mean to be IN? Choosing to be IN ensures the organization’s continued success. 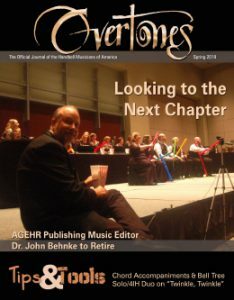 Why Support Handbell Musicians of America? Your tax-deductible donation to Handbell Musicians of America plays an important part in launching new programs, developing special projects, and enhancing member benefits. Membership dues cover the production of Overtones, administrative expenses, and basic operations. An additional base of contributed income is needed ensure the artistic and fiscal vitality of the Guild. Consider becoming a Sustaining Partner with your annual gift of $1500 or more and receive additional benefits. See the details here. You also have the option of making a more targeted contribution to support scholarships, grants and other specific needs. 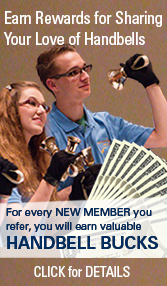 For more information about specific Handbell Musicians of America Funds, follow the links below. We’re excited to announce that Handbell Musicians of America is now an AmazonSmile participant! AmazonSmile is a simple way for you to support the Guild every time you shop at Amazon, at no cost to you. Simply click on the “Get Started” link to the left and sign in with your Amazon account information (or create an account if you do not already have one). Be sure to bookmark that page so that every time you shop at Amazon, you’ll be helping to support the Guild. Amazon will donate .5% to Handbell Musicians of America.